This tiara of diamonds and sapphires was inherited by the other major branch of the current Danish royal family: the family of Alexandrine's younger son, Prince Knud. The tiara was worn by his wife, Princess Caroline-Mathilde, as well as his daughter, Princess Elisabeth. Eventually it ended up in the collection of their younger son, Count Christian of Rosenborg, and it was worn frequently by his wife, Countess Anne-Dorte. 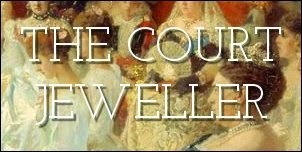 Both Christian and Anne-Dorte have recently died, and it's presumed that the tiara was inherited by their daughters, but I don't think any kind of official announcement about the inheritance of the jewel has been made. The tiara was originally convertible, able to be worn as both a diadem and a necklace. I've read that the piece originally belonged to Alexandrine's mother, Grand Duchess Anastasia, but I'm not sure that's ever been confirmed. This brooch from Alexandrine's collection is worn today by Princess Marie; it was previously worn by Marie's mother-in-law, Queen Margrethe. The piece can be worn as a pendant on a necklace or as a brooch; its pendant drop can also be removed. The piece's origins are apparently not known, but Alexandrine wears the brooch in portraits that date to the turn of the 20th century.